Other nutrient management guides on maize, sorghum-millet, rice and banana are also available. Produced by ASHC. 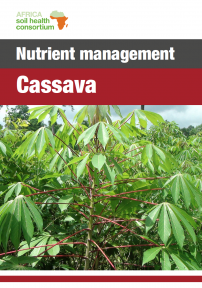 A 12-page guide that provides details of nutrient management practices necessary for cassava production. It focuses on fertilizer and organic matter use and good agricultural practices such as intercropping. 8 page, A5 booklet on how to grow cassava. For farmers in Ghana.